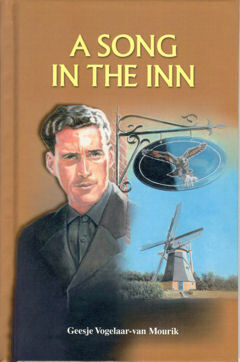 Hendrik Veermans grows up as the son of an innkeeper. As much as possible, his father keeps him from anything that has to do with God and His service. At first this grieves Hendrik, but as he grows up he begins leading a careless life far removed from God and His service. Then the Lord brings back something that happened many years before in his father's inn. "Sir... Sir do you know of a place where one can spend the night?" The old man turned around. Briefly he looked at the stranger. "Certainly," he said. "Just follow me." They walked into a narrow street. When they came to the third house, the old man stopped and said, "Here it is." The iron numbers "1670" were firmly fastened to the facade of the building. "That's an old house," the stranger observed. "Yes, the inn is already a couple hundred years old," the old man answered. "But Veermans maintains the building very well. Recently he repainted it. He is careful about his business. At one time the inn belonged to his great-grandfather. After that it belonged to his grandfather. Finally, Veermans took it over from his father." "I see... Well, this appeals to me. Everything looks very well kept," said Rips. He looked at the enamel signboard that hung above the entrance. "I can't say I like the looks of that signboard, with that bird of prey holding a little lamb in its claws." The old man agreed. "Yes, the inn isn't called 'The Flying Eagle' for nothing. A lot of money has been spent there throughout the years." The hand holding his cane trembled. "Some people drink too much. It's not good for their bodies or for their wallet. Later they regret it!" He blew his nose in a large red handkerchief. "Well, I don't come here anymore. I am going to hurry home. It's too cold out for me." The old man disappeared into the darkness. "Thanks for all your help!" Rips called after him. Then he opened the heavy front door of the inn and stepped inside. The warm smell of tobacco met him at the door. "Good evening," Rips said. A woman with dark, curly hair smiled at him from behind the bar. He sat down at a table and looked around the barroom. It all looked very neat. Two men were busy talking to each other. One of them turned around to look. "A stranger," he said to his partner. Then they continued their conversation. The door behind the bar was opened by a muscular man with blond hair. That had to be the innkeeper. For a second he spoke to the woman, and then made his way to the stranger. "Good evening," he said. "What will it be?" "I would like something to eat," Rips answered. "Perhaps you would like to have a cup of coffee first? My wife brews a pretty strong cup; that's for sure. Just ask those men over there." "Oh, I believe you, but those gentlemen are drinking something other than coffee now." "Sure enough, on Saturday evenings they prefer something stronger. I can't really blame them. Every day they work hard. Every morning they get up early to go to work to support their wives and children. And they usually have a lot of children. But let me assure you, things are always done in an orderly fashion here," he quickly added. "Of course..." Rips said. "Well, I would like a cup of coffee. After that, I would like a meal! Can I stay here tonight as well?" "Certainly! My wife will make sure your room is in order. Everything will be arranged." "Father..." A small boy entered the barroom. His blue eyes shone with excitement. His round cheeks were a picture of health. Dark curls hung over his forehead. "Wait a minute, Hendrik. I have to get some coffee for this gentleman." "So your name is Hendrik?" the stranger asked. "You sure have nice curls." "Yes," Hendrik said. "Just like my mother." His blue eyes were beaming. He remained standing at the table. Father put a cup of coffee in front of the guest. "Come Hendrik, go to your mother now," he said. "That man is drinking coffee. He doesn't want to drink anything stronger," Hendrik said when Father came to him a little later. "Just like the neighbor lady." "The neighbor lady?" Father asked. He pulled on his suspenders and let them snap on his big stomach. "How do you know that?" "The... the neighbor lady said..." Hendrik stammered. Father looked at him sternly. Hendrik almost did not dare tell him. Perhaps Father would become angry, but he had to tell him. "That Arie is not getting such nice clothes as I have, because...because his father gives you all his money. You shouldn't. . . sell any more strong drink." Father stared at him thoughtfully. "That would really be something," he replied. "Our chimney can't smoke from mother's tea and coffee, if you know what I mean." "Oh..." Hendrik said disappointedly. "So we have to, but I feel bad that Arie can't get any new clothes." Annoyed, Father shoved a glass toward the back of the counter. "Those are things that do not concern you," he muttered. "If you are going to whine about it, you might as well go to bed." Hendrik quickly went to the kitchen. Mother was just finished making a dinner for the gentleman. It looked delicious. "I'll get you a piece of sausage in a minute, Hendrik," Mother said. Mother was always very friendly. She did not object to his playing with Arie. Father would rather that he didn't. But it was always so nice at Arie's house. Arie's father was a miller. It was so much fun to play hide and seek in the windmill; there were so many nooks and crannies in which to hide. Often they were allowed to watch when grain was being milled. The fine grain would rustle into big burlap bags. He had better not hum too loudly, because he didn't want Father to hear it. He didn't care for "all that pious stuff." "Here is your sausage," Mother said. She gave him a small plate with a piece of sausage on it. How good it smelled! As he bit into it, the juice ran down his chin. It tasted very good. He would love to lick his fingers, but Mother did not allow him to do that. Quickly he wiped his hands and face with the blue checkered cloth that was hanging in the kitchen. The stranger also thought the food tasted good. Hendrik could see that he was enjoying his supper. The bell above the door jingled. He did not have to look who was coming through the door. Of course, they were the usual Saturday evening guests -- Claus Veldhoven, the miller; Simon Schot, the smith; and Sander Schimmel, the wagon maker. They were always there.